A lighthearted—but factual—look at some of the craziest cults in modern history. Do you prefer applesauce (Heaven’s Gate) to Kool-Aid (Peoples Temple)? Do you think carrots are “the food of the Masters” (Church Universal and Triumphant) or that swimming and joking should be forbidden (the Fellowship of Friends)? This is the book for you! We help sort your E.T.-loving Raelians from your Moonies, your snake-handling Church of God with Signs Following from your Branch Davidians. 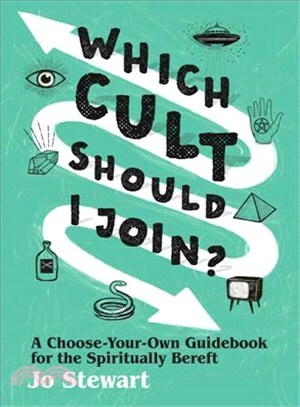 To make the path to the reader’s chosen cult easy, Which Cult Should I Join? is structured like a Choose Your Own Adventure book—in that the reader makes a series of decisions along the way to come to their chosen cult. And with forty of the most high-profile modern cults covered, we have one to suit every reader. Jo Stewart is a Melbourne-based writer who contributes words and images to a variety of magazines, newspapers, and websites, including Vice and Yen magazines.